One need to know about the promotion tenures in your organization, skills and qualification required for the promotion, observe your seniors who are promoted and ask their advice .Hence , for all these you need to know the promotion ladder in your organization. You need to reach your goals before the stipulated time and should report your higher official which creates a good impression and you should never skip your responsibilities and maintain a diary of your responsibilities and work. You should always ready to accept the additional responsibilities if you are asked to and complete the work as faster as you can and if you are not able to complete the work try to take advice from the seniors so that they may help you . Their may be situations where you need to provide more time for your work rather than your social life. So , you need to manage both by explaining about your goals and objectives by which you will acquire support from your family and friends and their by you can work with full concentration. Yes, in order to maintain a good relation with other employees you need to support and motivate them when they are needed and this will prove you as a leader. Learning should be your daily routine. you should always be ready to learn new things and upgrading your knowledge with the changing environment. This also helps you to identify your adaptability by the higher officials. You need to maintain a report of all your work assignments and need to submit the report when your senior is asked to. 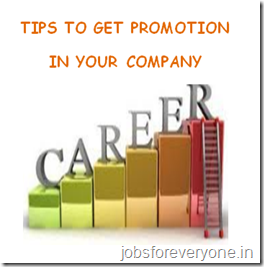 Hence, these are the various tips which helps you in getting promotion and falling in the eyes of your higher officials of the company. I hope this article helped you in upgrading your career in your organization.